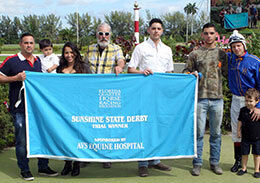 HIALEAH, FL�FEBRUARY 6, 2016�Shes A Tourist was moved to the top qualifying spot for the $200,000-Guaranteed Sunshine State Derby on Saturday after Ahs Uncle Si was disqualified and placed fifth for interference in the first of three trials contested at Hialeah Park. The 10 fastest qualifiers, from the 25 registered Florida-bred starters sired by accredited Florida-bred stallions, will return to the South Florida raceway on Saturday, February 27 to vie for the winner's share of the $200,000-Guaranteed final. The purse includes $30,000 in added-money. Squeezed at the start, jockey Yordanis Amaro got quick speed from Shes A Tourist to completed the 400 yards in :19.450 seconds, a 101 speed-index into a 7 mph crosswind. The lightly raced daughter of stakes sire Ethics Aside was making only her fourth career start and entered the race off a maiden win at Hialeah Park on January 4. Elio Vazquez trains the sorrel filly for owner Double A Ranch. Jorge Luis Gonzalez bred Shes A Tourist in Florida from the Okey Dokey Dale mare Deluxcious. She has a combined record of (4) 2-0-1 and has earned $17,283. Even though Ahs Uncle Si was moved to fifth in his trial, he still qualified for the final with sixth fastest time. Leading trainer Judd Kearl conditions the stakes-placed son of Struttin To Beduino for owner/breeder Alicia Hill Smith. The bay colt entered the trials off a third place finish in the $100,580 Hialeah Derby on January 17. Donnie Strickland saddled Burnin For You to half-length victory in the last trial to garner the fourth fastest time of :19.781 seconds with a 9 mph tailwind. Chris Watson owns the This Flights For You filly out of Bye Bye Rayburn, by Dashin Bye. Benito Baca was aboard the Gene Cox bred runner. Streakin Knight broke his maiden for owner/breeder Edgar Vargas in the second trial to earn the 10th qualifying spot with a :20.053 clocking into a 6 mph crosswind. Leading rider Rodrigo Vallejo was aboard the son of Streakin Six Cartel. Making only his fourth career start, Streakin Knight is out of the thoroughbred daughter of Kelly Kip My Little Mimi. For a complete list of Sunshine Derby finalists, times, sires, dams, owners, breeders, trainers and jockeys CLICK HERE.